This is where we try to answer some of the questions you may have about arranging your Key West Fishing Charters with us on the SeaClusion. For more information about our Key West fishing charters including the current fishing rates, feel free to call us toll free at 800-818-5667 or 305-295-0774 or contact us online. • we can accommodate 6 anglers (passengers) but we only book whole fishing (private) parties. this means you will never have others joining your charter. • we include in all Key West fishing charters: all fishing equipment,tackle,licenses and bait appropriate for the type of deep sea fishing you want to do. • we include water on all charters . arrangements for food and beverages are easily accommodated. • we offer full day, half day, swordfishing, and custom trips. we also offer fishing tournament packages. 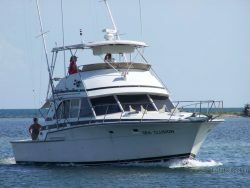 • on a typical Key West fishing trip the time from leaving the dock to lines in the water is approximately 30 minutes . this can very depending on time of year and the species of offshore fish you want to fish for. • please bring your favorite sun screen,any motion sickness remedies you like and whatever clothes you may need. a foul weather jacket offshore in the winter when the tuna bite is on is nice to have. • we must receive a deposit of $250 for all fishing charters to hold your date for you. • we will refund 100% of your deposit if you cancel your charters prior to 72 hours before your trip. • if you must cancel your reservation within 72 hours we will try to make arrangements for another date with your deposit. • cancellations of less than 72 hours are not refundable. • if we cancel a trip for any reason a 100% refund will be made if another date cannot be arranged to your satisfaction. • we can recommend Key West hotel/motel and guest house accommodations. • tips are appreciated and are a very real part of the income of the crew. • we will clean, filet and package the fish you want to keep at no additional charge.